It’s been a long time since I posted to Look Up, Look Around, but I am so disappointed that the Vancouver ghost is gone that it has prompted me to write. 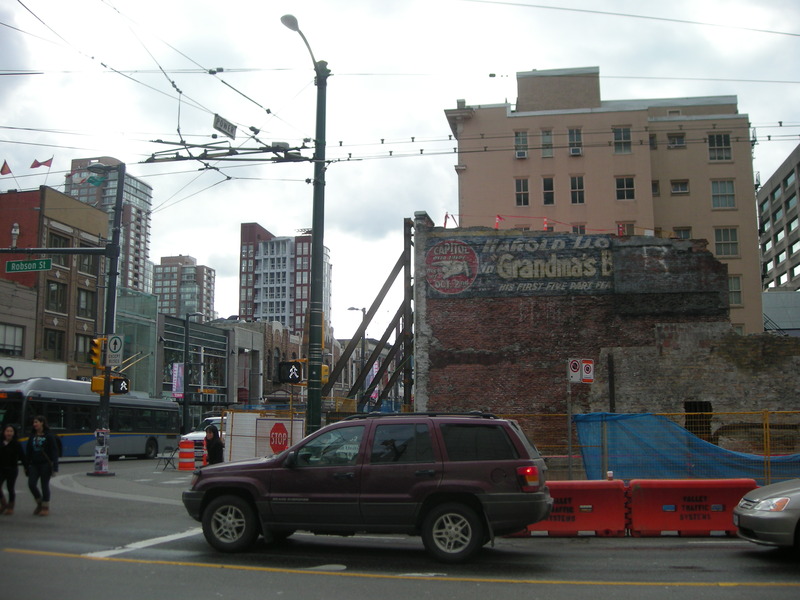 The application for development sign had been up on the buildings at the corner of Granville Street and Robson Street in the heart of the entertainment district of Vancouver for some time. I walked past it everyday on my way to or from home since I moved here in April 2011. The corner building, low-rise and a bit non-descript, had either lost much of its character or had kept it quiet. Its neighbour is beautiful and ornate with an Egyptian-like art deco pattern – designated as heritage, its façade would be saved no matter the fate of the corner building. By January 2012, the buildings were vacant and boarded up. The scaffolding was erected and in February the walls started to come down. And then we were rewarded beyond expectation. The writing was on the wall – or rather the advertising was on the wall. 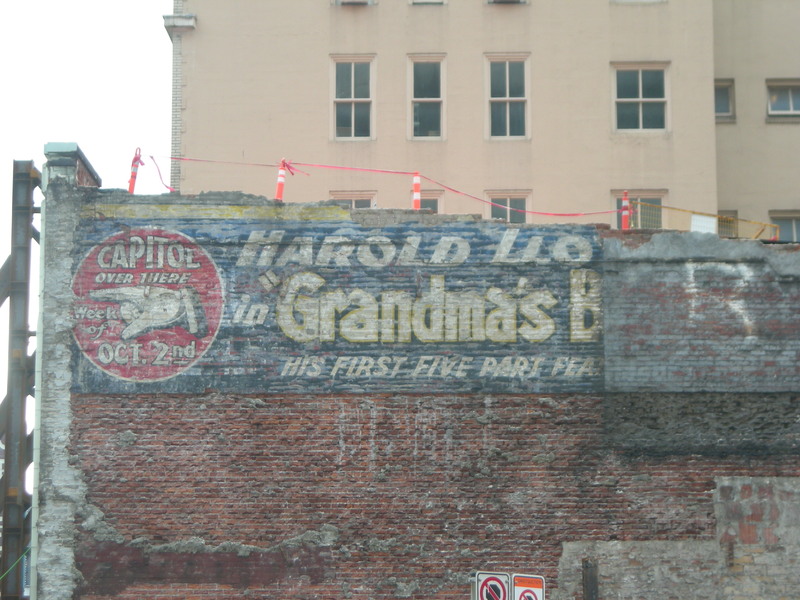 The demolition of the corner building, revealed the former outer wall of its prettier neighbour and there was a 1920s advertisement painted on it. The discovery should have been treated like uncovering an archaeological find. Demolition should have halted whilst historians and archaeologists figured out how to preserve it. But sadly, the vintage advertisement was not recognized as an important part of Vancouver’s history and was brought down in the name of property development. I’m all for greener buildings that serve our current and future purposes, but don’t forget that we are also our history. We revel in vintage, antique, and archaeological treasures. We marvel at where our ancestors came from, the technology that was available back then – they tell a story that is captivating, fascinating, and enlightening. The wall from the 1920s should have or could have been preserved much like some of the roman walls and arches have been saved in London. A hundred years or more from now, we’ll be non-existent to our descendants. The story that will be recounted, will be a sad one of how a selfish, uncreative, unenlightened society reduced its history to rubble, all for the sake of an ugly, cookie-cutter building decorated with a “For Lease” sign.